Beirut (AFP) – Syrian rebels have agreed to surrender a sensitive area bordering the Israeli-annexed Golan Heights, a monitor and opposition source said Thursday, the latest in a series of deals expanding regime control over key territory. Both deals, negotiated by regime ally Russia, will be seen as victories for President Bashar al-Assad over the seven-year uprising that once threatened his rule. With a mix of military power and negotiated surrenders, his forces this month captured more than 90 percent of Daraa, the southern province where protests against him first erupted in 2011. 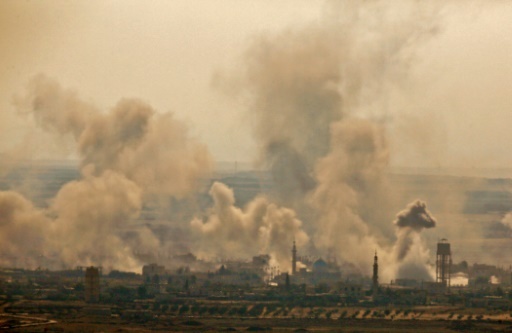 They then began intensely bombing rebels in Quneitra, a crescent-shaped province wedged between Daraa and the buffer zone with the Israel-occupied Golan to the west. Under pressure, rebels have agreed to hand over Quneitra and the buffer to government forces, an opposition negotiator and a monitoring group told AFP on Thursday. “The deal provides for a ceasefire, the handover of heavy and medium weapons, and the return of government institutions to the area,” said Rami Abdel Rahman, head of the Syrian Observatory for Human Rights, a Britain-based monitoring group. The agreement, according to the Observatory, does not include Hayat Tahrir al-Sham, a jihadist-led alliance that holds territory straddling Quneitra and Daraa. State news agency SANA said it had information on a deal for the army to return to its pre-2011 positions in the area, without providing more details. AFP / OMAR HAJ KADOUR. 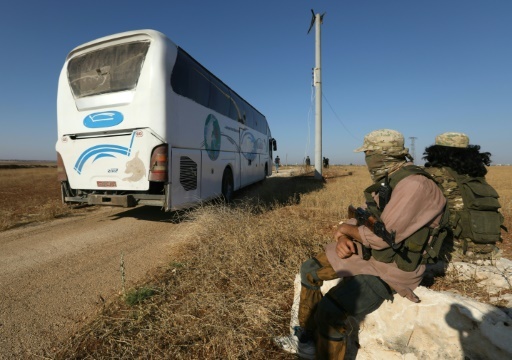 Members of the Hayat Tahrir al-Sham group, led by Syria’s former Al-Qaeda affiliate, watch as busses get ready to enter the towns of Fuaa and Kafraya to evacuate their residents on July 18, 2018. A rebel negotiator confirmed a preliminary ceasefire agreement on Quneitra had been reached with Moscow but said it was unclear when it would be implemented. Under it, he told AFP, Syrian government forces accompanied by Russian police would enter the buffer zone. There was no comment from Israel on Thursday, but its military said it was keeping a close eye on the border, where tens of thousands of Syrians have sought safety from fighting. Israel seized 1,200 square kilometres (460 square miles) of the Golan from Syria in 1967 and later annexed it, in a move never recognised internationally. It sees security in the area as a top priority, with Israeli Prime Minister Benjamin Netanyahu discussing the south with Russian President Vladimir Putin in Moscow earlier this month. Russia is a decades-old ally of Syria’s government and has used a carrot-and-stick strategy against rebels to help Assad regain the upper hand. Moscow began bombing Syrian rebels in 2015 but has also reached out to them, securing negotiated surrenders of vital areas. It even brokered a deal this week to evacuate thousands of besieged people from a pair of pro-regime towns in northwest Syria. Fuaa and Kafraya in Idlib province were the last remaining areas under blockade in Syria and a rare example of pro-government towns surrounded by rebel forces. Besieged for three years by rebels and HTS, the Shiite-majority towns had become a rallying cry for the government and Iran, another key regime ally. A deal between Russia and rebel ally Turkey saw thousands of residents bussed out on Thursday to regime-held areas in Aleppo. The departure was emotional and bittersweet, said Shilan Shuweish, a Fuaa resident who left with her husband and two children. “It’s a huge loss,” Shuweish, 28, told AFP, writing from the bus via a mobile messaging app. “We left our homes behind, but at the same time we’ve got kids here that until this day don’t know what an apple is,” she said. AFP / George OURFALIAN. 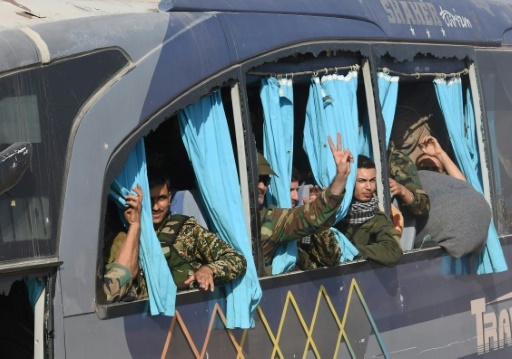 Busses transporting residents and fighters from the towns of Fuaa and Kafraya arrive in Syrian regime-held territory at the Al-Eis crossing point south of Aleppo on July 19, 2018. Some 6,900 civilians and fighters left, fully emptying the towns. HTS has said that 1,500 detainees would be released from regime jails in exchange for the evacuation. On Thursday, a gaunt man released from regime custody could be seek tearfully hugging a younger rebel fighter at a staging ground between opposition and government territory in northern Syria. But a Syrian advocacy group slammed the regime, saying long-detained rights activists were not among those freed. “They are releasing detainees who’ve been detained for two or three months — so the peaceful activists detained for years are not included in such deals,” said Laila Kiki, executive director of the Syria Campaign. Featured Photo: AFP / JALAA MAREY. A picture taken on July 16, 2018 from the Israeli side in the annexed Golan Heights, shows smoke plumes rising from reported Syrian and Russian air strikes across the border in Syria’s southern Quneitra province.